Washington became the 42nd state to join the Union on November 11, 1889. The state boasts vast tracts of forested land, and timber production is naturally one of the state's economic assets. Nicknamed "the Evergreen State", Washington values its forests for their contribution to both the economy and to the region's ecosystems. The official state tree, the western hemlock, can attain towering size and beauty. Powerful rivers run through the state, providing natural habitat for one of America's best game fish, the steelhead trout. The mighty Columbia River is home to one of the world's most massive masonry structures, the Grand Coulee Dam, which provides 30% of the nation's hydroelectric power. 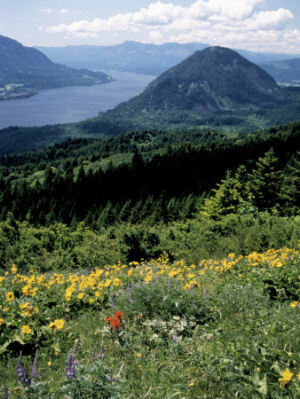 From the unique temperate rainforests of the west to the apple-producing orchards of the east, Washington is a state of fantastic natural beauty. You guessed it! The Washington Territory established in 1853 was named to honor the first President of the United States, George Washington. Washington is popularly known as "The Evergreen State." This nickname, coined by Seattle realtor C.T. 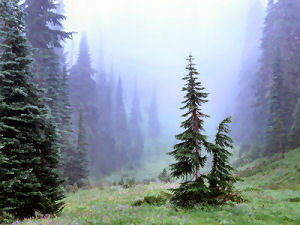 Conver and adopted by the state in legislature in 1893, was given because of the large fir and pine trees in the state. Washington is always green, a color echoed in the State Flag. This is another nickname referencing the conifer forests of Washington. One doesn't hear this nickname too often, but it can be traced back to 1890. This nickname refers to the Chinook Indians of the state. People who live in Washington or who come from Washington are called Washingtonians. The second commemorative quarter-dollar coin released in 2007 honors Washington, and is the 42nd coin in the United States Mint's 50 State Quarters® Program. Washington, nicknamed the "Evergreen State," was admitted into the Union on November 11, 1889, becoming our Nation's 42nd state. The reverse of Washington's quarter features a king salmon breaching the water in front of majestic Mount Rainier. The coin bears the inscriptions "The Evergreen State," "Washington" and "1889." In April 2005, Governor Chris Gregoire established the Washington State Quarter Advisory Commission to help guide the quarter selection process. The Commission requested that residents submit design narratives representing various Washington themes. The Commission received more than 1,500 suggestions and chose five narratives to pass on to the United States Mint. United States Mint sculptor-engravers and artists in the United States Mint's Artistic Infusion Program created the corresponding design images. The residents of Washington participated in a statewide vote in April 2006, in which more than 130,000 votes were cast. On May 4, 2006, Governor Gregoire announced Washington's recommendation at Centennial Elementary School in Olympia, Washington. 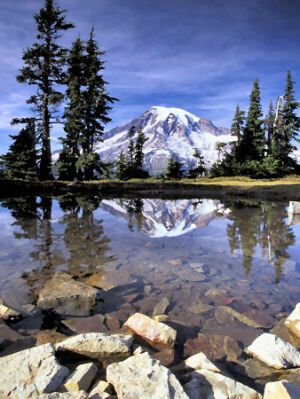 Governor Gregoire's recommendation, a king salmon breaching the water in front of Mount Rainier, received the majority of votes cast in the statewide poll. The Department of the Treasury approved the design on June 22, 2006. The two other designs considered during the statewide vote were a design depicting a salmon, Mount Rainier and an apple within an outline of Washington State, and a Northwest Native American-stylized orca. Carpenter, Allan &amp; Provorse, Carl. The World Almanac® of the U.S.A. . Mahwah, N.J.: World Almanac Books (An Imprint of K-III Reference Corporation, A K-III Communications Company), 1996. Washington (From Sea to Shining Sea) , by Christine Webster. 80 pages. Publisher: Scholastic Library Publishing (March 2003) Reading level: Grades 3-5. Presents information about Washington's people, geography, history, landmarks, natural resources, government, state capitol, towns and cities, and more. Washington (World Almanac Library of the States) , by Rachel Barenblat. 48 pages. Gareth Stevens Publishing (January 1, 2002) Reading level: Grades 4-6. Filled with the most up-to-date information, including the latest Census results. Full-color photos bring to life the story of Washington. In addition to an in-depth factual profile of Washington in the form of a state Almanac, this book offers fascinating and lively discussions of the state's history, people, geography, government, economy, culture, and lifestyles. A section on Notable People, a calendar of events, and enough primary source documents, time lines, maps, and other tools to make this unquestionably the best young adult reference material on the USA available anywhere. The Washington Almanac: Facts About Washington , by Andrea Jarvela. 240 pages. Publisher: Westwiinds Press (June 1, 2003) A fun-filled, information-packed source of entertaining factoids on Washington State, this first edition of The Washington Almanac is an essential read for anyone wanting the latest, greatest scoop on the regional history, natural geography, economy, and people of the Evergreen State. Washington's History: The People, Land, and Events of the Far Northwest , by Harry Ritter. 144 pages. Publisher: Westwiinds Press (June 1, 2003) An anything-but-dry history textbook in a pocket-sized package, Washington's History is a fascinating walk through the lengthy story of a place and its people. Historian Harry Ritter introduces the Native American peoples who lived in the region's coastal rainforests and inland plateau, the European and U.S. seafarers who explored and mapped the complicated shores and islands, and the leaders involved in conflicts over boundaries, resources, and religion. There's the story of The Pig War, which began with an assassinated pig in 1859 and escalated into an international skirmish. Read about the construction of the massive Grand Coulee Dam in 1933, and the creation and aftermath of Hanford, and the hopefulness surrounding the World's Fair. And then there's the land itself: vast, stirring in its stark beauty, and fearsome when natural disaster strikes, as it has in every century. Exploring Washington's Past: A Road Guide to History , by Ruth Kirk and Carmela Alexander. 543 pages. Publisher: University of Washington Press; Revised edition (October 1995) Exploring Washington's Past tells the state's story in terms of where to go and what to see. With words, photographs, and maps, the authors evoke the cultural landscape and portray Washington's people and events from the days of the fur trade and pioneer settlement to the recent past. Capsule descriptions of small communities - from Altoona to Zillah - are interwoven with those of better known cities, and eastern and western Washington receive equal attention. More than two hundred photographs portray our historical landscape through images of today intermixed with a sampling of the past. This book will be an indispensable guide for residents, tourists, and armchair travelers. Copyright &copy; by NSTATE, LLC. All rights reserved.